Five Dorshei Derekh members are participating in the MS 150 fundraising bike ride at the end of September from Cherry Hill to Ocean City NJ and back (75+ miles each way) for the purpose of improving medical research for multiple sclerosis. We appreciate that there are a number of other opportunities for you to support fundraising rides and walks. We would be honored if you would also consider contributing to our efforts – whatever you feel comfortable giving. The riders are Adina Abramowitz, Kate Cook, Naomi Klayman, Amy Lowenthal, and Carol Tinkleman. You have the option of contributing to us individually at the websites listed below, or supporting us as a group by making out a check to National MS Society and mailing it to Naomi Klayman, 7340 Rural Lane, Philadelphia PA 19119. All funds raised through checks will be shared by us equally. Thank you for considering supporting our ride. 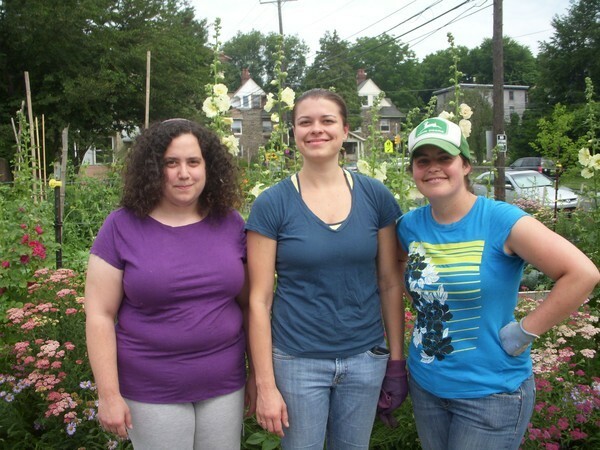 Great Article about Dorshei Derekh Urban Farmers! Look who's featured in The Mt. Airy Patch! A small but thriving green space brightens a stretch of Chew Avenue near East Mt. Airy Avenue. Tucked into a colorful border of yellow and pink yarrow, hollyhocks, and sunflowers, a sign declares that this neighborhood haven, called “Gabbie’s Garden,” is part of the East Mt. Airy Community Garden Network. The “Network” refers to a group of about 35 people individuals or families who tend plots at Gabbie’s Garden as well as a smaller garden a few blocks away called Werner’s Garden. Both properties are owned by local businessman David Fellner—the owner of the Sedgwick Theater—and the gardens are named for his parents. The lots were weedy and often littered with trash before the gardens got going. A house owned by Fellner sits adjacent to Gabbie’s Garden, and he supplies water for both gardens and pays for mowing. “We water each other’s plots, share food, and have occasional cookouts,” Kamm said. The group has also received small grants from Weavers Way Community Programs, which they used to purchase topsoil, fencing, and other necessities. But this is very much a do-it-yourself operation. Kamm built her own raised bed with boards from a discarded shelving unit she found on the street. Topsoil, mulch, and plants often come courtesy of Ames or fellow member Bill Shick and their landscaping and urban farming connections. Folks mostly bring their own tools and supplies, but Kamm said they would eventually like to purchase a shed. 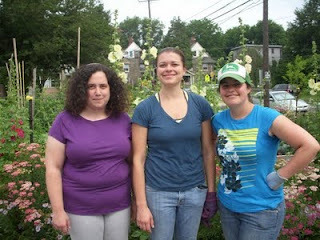 A Wiki site and email list ensure that everyone stays informed about garden happenings and news. Each individual or family pays $15 per year for membership (sorry—there are no current openings) and signs an agreement to garden organically, be respectful of each other and attend work parties, which is when they tackle communal tasks such as weeding the pathways or exterior plantings, removing ivy or turning the compost pile. In the garden, each separate plot is different from the next. Kamm’s own plot overflows with six varieties of heirloom tomatoes, as well as potatoes, cucumbers, zucchini, chard, and lettuce. I asked her if it wasn’t a little bit over the top for one person.